It’s Trina here today, just back from vacation. 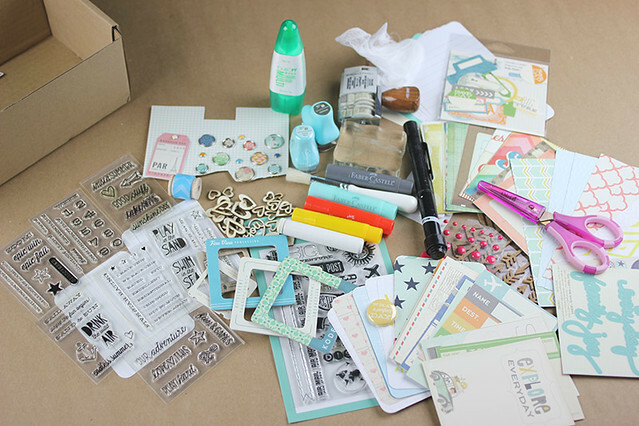 I don’t know about you, but I can never go on a trip without bringing my scrapbooking with me. Today I thought I’d share what I do to pack just enough to get a little scrapbooking in while I travel. For my recent trip I included items from the June and July Main and Project Life kits (I couldn’t resist mixing and matching the kits for our trip). I scrapbook in miniature when I travel, using the Simple Stories SN@P! sleeves. I especially like the 6 x 8 sleeves because I can do quick mini scrapbook pages to showcase 1 or 2 photos. These pages only take about 15-20 minutes each, so it’s easy to do while traveling. This is my favorite 6 x 8 mini page from our vacation. The tiny Instax 8 Polaroid photos worked perfect for this page size. 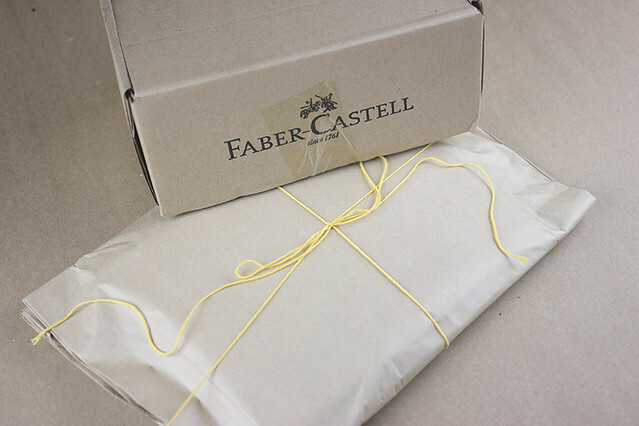 I used the string that was wrapped around my paper bag on almost every page I did. I glued the string down with Tombow Mono glue. This page was a lot of fun to make. The backside of the wood-grain paper (July Main kit) is hexagon shaped umbrellas. I cut out around one of the hexagons so there was a hexagon-shaped hole in the 6 x 8 paper. Next I cut a small piece of paper out and glued it to the back of the wood-grain paper so pattern paper shows through. Then I cut out one of the hexagon shapes from the label sheet that we include in our PL kits. Last, I put a thin strip of Monoglue around the edge of the bigger hexagon to glue down the yellow string. 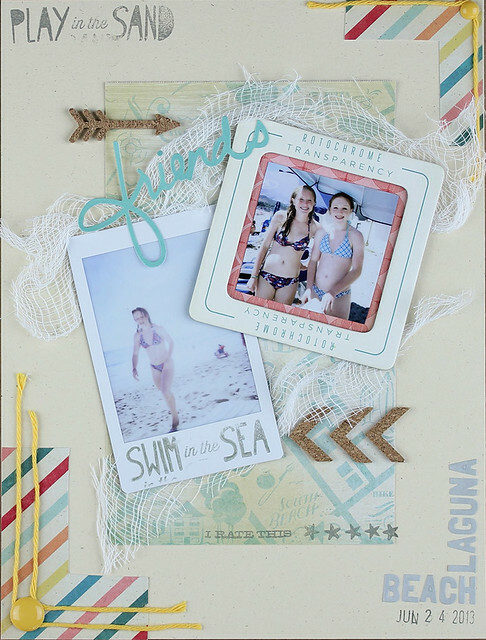 Framing a shape or a photo with string will add a fun little pop to your pages. Thanks for stopping by our blog today. 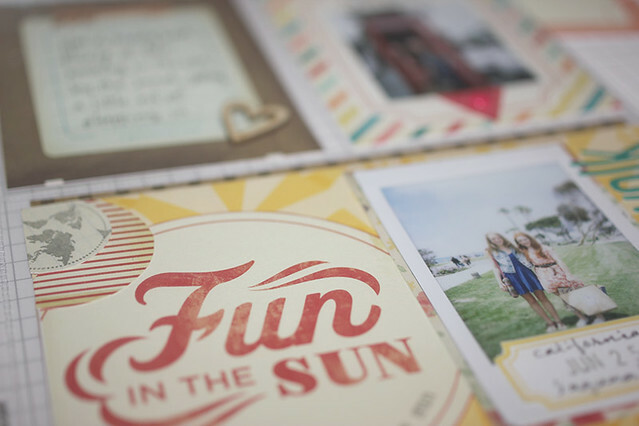 I hope you find some scrapbooking inspiration from this for your family vacations this summer. 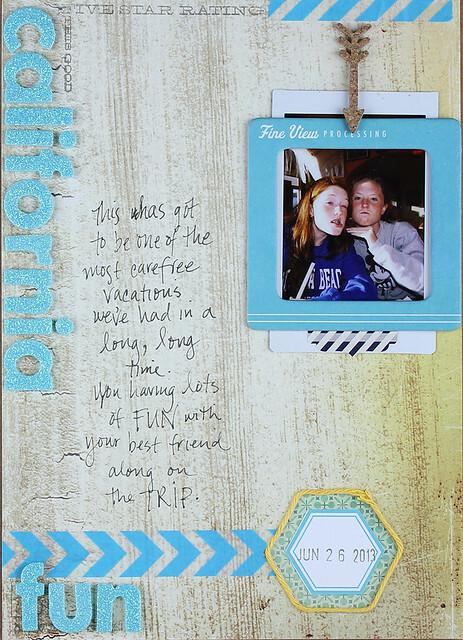 Never leave your scrapbooking at home! wowzer! 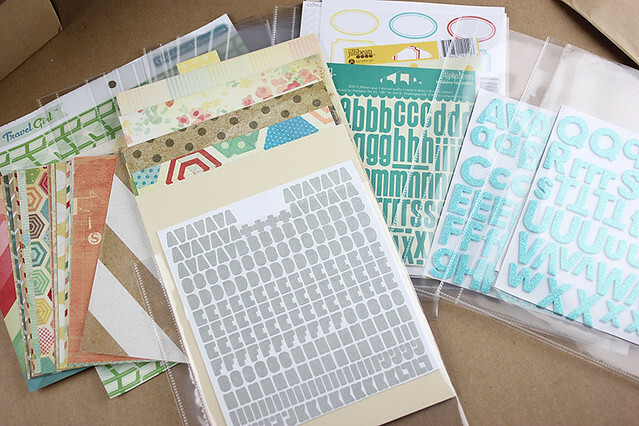 i hate packing my scrapbooking supplies when i travel! thats the toughest thing to do on earth! Great pages, Trina! How did you get your "Play in the sand" stamp to be in a straight line like that instead of three lines? Did you stamp them separately three times? 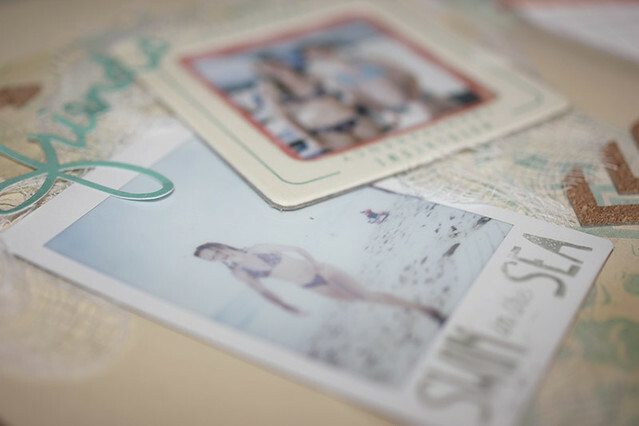 Also, I spy some OA Travel girl journal cards and the pier 6x6 pad! 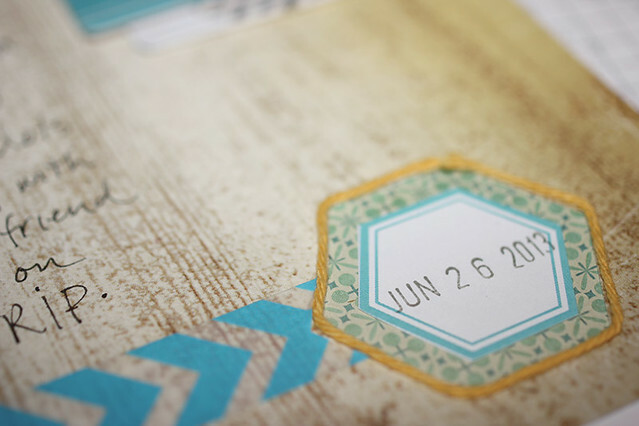 I see diecuts from the Atlantic collection in the July main kit. 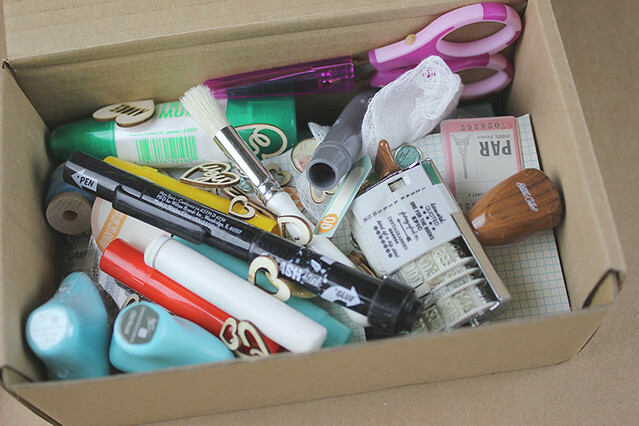 Thanks for sharing what and how you pack supplies for travel. I always struggle with how much and what to take. Wow! That's amazing...i've only been able to scrap an album once so far during my travels!! Great kit of materials you're got!! I definitely see october afternoon travel girl brads, prima inkers, gelatos. Some good stuff for any kind of kit. love this! 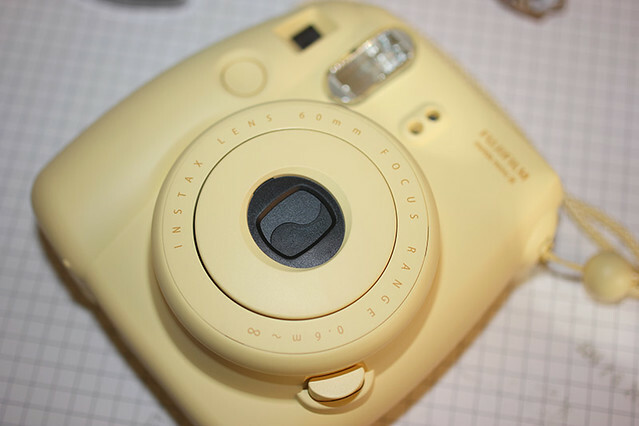 How does the new instax compared to the old one as far as quality? Does it take better photos than the old one?